When Jack Frost is nipping at your nose, that's when everyone craves a nice, hot, tummy-warming bowl of soup, just like mom used to make. 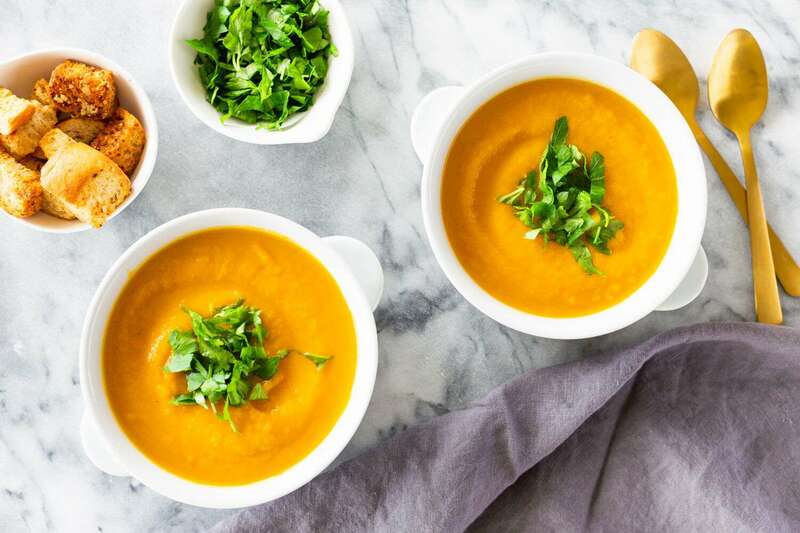 We've got you covered, with easy recipes for homemade soups that will warm you up and satisfy your taste buds, while delivering plenty of yummy flavor and satisfaction. From the classic homemade minestrone soup, potato soup and chicken noodle soup, to more exotic soup recipes featuring Tex-Mex, Thai and Indian flavors, you'll find all of our favorite winter soups listed here. Choose your favorite soup recipes to try this winter, or work your way through the entire list! This creamy, bright-tasting dairy-free butternut squash soup makes a wholesome, warming winter lunch, or a great first course at family dinners and get-togethers with friends. It's especially great served alongside a grilled cheese sandwich. Simple and inexpensive to prepare, and also dairy-free (soy milk is used to deliver creaminess), this versatile vegan soup is a great staple recipe to have in your back pocket. This recipe includes ideas for different ways to prepare this soup, if you prefer a spicier or thicker preparation. Here's a hearty, Tex-Mex inspired vegetarian soup recipe that's perfect for cold winter days, when you need something warming in your tummy. Black beans, corn and soft tortilla strips combine in a thick, tomato-rich broth that's amped up with Mexican spices and topped with shredded cheese and taco fixings. Vegetarian-friendly, protein-rich and packed with fiber, this is a great winter soup recipe to pack in a thermos for school lunches, or take to the office on brown bag days. When it's cold outside, nothing hits the spot quite like a creamy, homemade chicken noodle soup. This quick and easy recipe makes use of condensed soups and real cream, for a thick and satisfying soup with fabulous flavor that's ready in less than an hour. Also loaded with nutritious, fresh chopped vegetables and herbs, serve this colorful, tummy-warming soup with bread or crackers and a tossed salad for a family meal this winter. 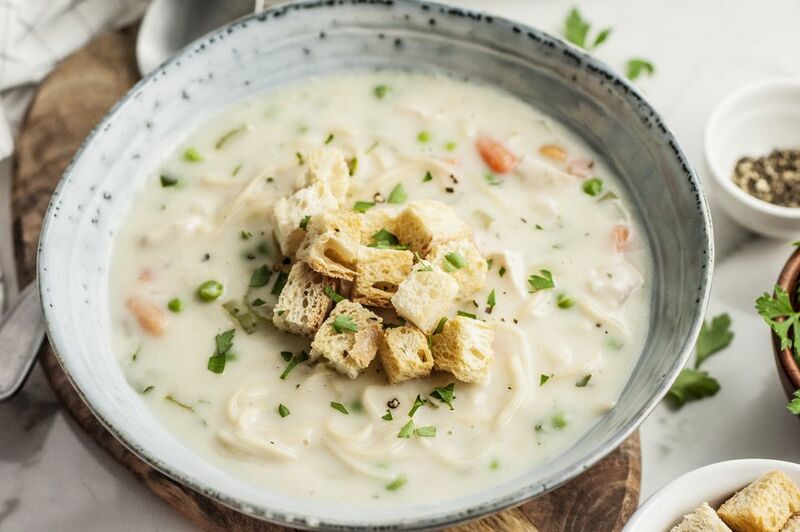 On a cold winter's day, this delicious, warming seafood chowder recipe makes a wonderful family meal, served along with biscuits, crackers or crusty bread. It's also fancy enough to serve as a first course at your dinner parties this winter. Fresh salmon can be used for this chowder, but it's also delicious with canned salmon. The fish combines with chicken broth, hearty potatoes, sweet carrots, light cream and cheddar cheese, for a thick and creamy soup that's simply packed with flavor. Italian Minestrone soup is a family favorite, and a wonderful way to enjoy the goodness of nutritious garden vegetables during the cold winter months. Vegetarian and vegan-friendly, this yummy, low-calorie, low-fat homemade soup recipe is packed with heart-healthy tomatoes, carrots, celery, green beans, zucchini, basil and garlic, all simmered slowly for maximum flavor. Macaroni pasta is added near the end of cooking, for a boost of filling goodness. It makes a delicious, light and healthy family lunch or dinner, especially when served with a side salad and some garlic bread. Yum! Bistro-inspired French Onion Soup is made with only five ingredients, but that can be your secret. This cheesy, hearty, elegant soup recipe is impressive enough to serve at all your dinner parties and holiday gatherings. Or treat your family to this soup as a satisfying winter meal, served with crusty bread or fresh rolls and a simple green salad. Leftover cooked beef is transformed into a tummy-warming soup that's perfect for a winter lunch or dinner, in this hearty Tomato Beef Barley Soup recipe. Potatoes and root vegetables are simmered with tomatoes, beef stock and barley for a homemade soup that's packed with healthy vitamins and fill-you-up fiber. You can cook up this family favorite soup in about a hour, or use your slow cooker to make things super easy. So many of us have happy memories of mom serving us rich and creamy split pea soup on frosty days. This delicious, crock pot soup recipe has all of the flavor of that childhood winter favorite soup, but uses herbs and spices in place of the usual diced ham, to add flavor and make this recipe suitable for vegan and vegetarian diets. Fat-free and low in calories too, you won't believe how delicious this homemade soup tastes. Vegetarian Pasta E Fagioli, or Italian pasta with beans, is a tasty, filling, high-protein pasta recipe for vegetarians and vegans that's just perfect for warming you up on a cold winter day. Pasta and white beans are cooked in an Italian-seasoned tomato sauce with plenty of garlic, fresh basil, oregano and paprika for a flavorful, satisfying pasta soup that's also rich in protein. Top it with Parmesan cheese (or skip it if you're vegan) and serve with a crusty bread or rolls, for a delicious winter dinner. This traditional, authentic Hungarian Goulash Soup recipe is cooked slowly for a long time, but is easy to make and packed full of flavor. It's a popular meal in Central and Eastern Europe, especially when the temperatures dip. Stewed beef and vegetables combine with paprika and other spices in this homemade goulash soup recipe, that makes a filling meal. Serve it for lunch or dinner with rye bread, for an authentic taste of Europe. Your family and friends will love this easy, cheesy potato soup that's hearty and enough to make a delicious meal with biscuits, cornbread or crackers on the side. Cooked ham, potatoes, Cheddar and potatoes are simmered in a creamy soup that's flavorful, filling and ready to eat in less than an hour. You can double this recipe easily for a crowd or tailgating event. Here's a creamy tomato soup that vegans can enjoy, too. Bright in color and flavor, this creamy, dairy-free version of a favorite soup recipe is wonderful with a slice of whole grain bread for a light lunch, or as the first course at a dinner party. This is a great way to enjoy the taste of cream of tomato soup in the winter months, when fresh tomatoes are pricey or hard to find. It also makes an excellent accompaniment to grilled cheese sandwiches, for kids and adults alike. Based on a time-tested Minnesotan recipe, cream of wild rice soup is a fantastic comfort food to have in your repertoire. Soothing and creamy, this is a great soup to serve the family for lunch after a busy day of outdoor winter fun. Hearty and filling, and just packed with meat, vegetables and rice, all swimming in a creamy broth, we challenge you to have just one bowlful. Cioppino is an Italian-American fish stew that originated in San Francisco. This recipe comes from a famous San Francisco restaurant, and is definitely fancier than the original, more humble recipe. Packed with fragrant white fish, sweet shrimp and delectable shellfish, simmered slowly in a rich and delicious vegetable broth, this fantastic recipe is perfect for a romantic holiday meal, or New Year's Eve dinner at home. You can make and freeze the broth ahead of time, adding the seafood ingredients in the last minutes of cooking. Vietnamese Pho soup is a hearty noodle soup that's meant to be eaten as a meal. This Pho recipe is packed with everything you need to warm your tummy and delight your senses on a cold winter day. Fragrant broth, soft rice noodles and Asian flavors combine with savory barbecue pork in a delectable, satisfying soup that's sure to leave your tummy full and your taste buds satisfied. This hearty lentil soup is full of flavor and is totally satisfying without all of the extra calories or fat! It's a simple soup that will warm you up this winter! Chicken soup is a wintertime favorite, but why not try something a little bit different? This delicious, East Indian-inspired chicken soup recipe has the wonderful flavor of curry powder and other classic East Indian spices, along with tomatoes, apples, a little rice, and diced vegetables. Make it for an easy soup and sandwich weeknight supper this winter, or serve with biscuits and a tossed salad as a complete family meal. Tom Yum Soup (also called Hot and Sour Soup) is a traditional soup recipe from Thailand. This version offers a vegetarian and vegan-friendly way to enjoy this delicious hot and sour soup. Packed with potassium-rich mushrooms, heart-healthy tomatoes and protein-rich tofu, plus the wonderful Thai flavors of ginger, soys sauce, lime and lemongrass, this first course soup is nutritious and an absolute delight for the senses on a cold winter's day. It's also delicious served over hot cooked noodles as a satisfying family meal. Creamy, filling and flavored with the irresistible taste of bacon, this hearty corn chowder is an excellent choice for lunch or dinner when it's cold outside. This delicious homemade chowder recipe is also versatile and easy to change to suit your tastes, with tips for yummy additions and variations included in the recipe. Tuscan bean soups are reliable tummy warmers on any cold winter's day. This gourmet-style, vegetarian twist on a classic Italian Tuscan white bean soup recipe uses chickpeas (also called garbanzo beans) and pasta in a deliciously seasoned broth, for a super-healthy and hearty winter soup. Fresh Italian herbs combine with red pepper flakes, garlic, sun-dried tomatoes and Parmesan cheese to create the flavorful broth for this filling soup. High in fiber and protein, and low in fat, you can enjoy this authentic Italian recipe guilt-free at lunch or dinner.